5 - 3,4................Bingo von Ellendonk. Osian von der Weyermühle gained his Schutzhund II title while his litter-sister, Ohra von der Weyermühle, passed the Erstkörung with high ratings for working drives and rated V in conformation shows. Osian's sire, Hertog Conan van Manensheide, was the winner of the D.V. 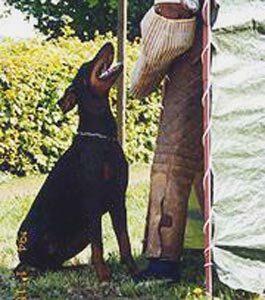 Meisterschaft in 1993 plus winner of numerous show titles and passed the Körung 'for life' with highest rating for hardness and working drives while his dam, Hera von der Weyermühle, competed at the D.V. Meisterschaft in 1993 and also passed the ZTP with 1A rating for character.